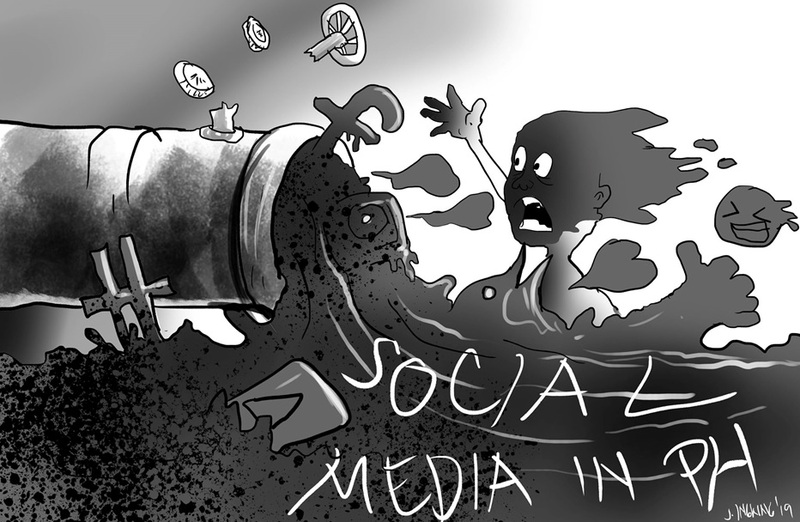 Must social media be regulated? OURS IS A DEMOCRACY – a type of government where people directly vote who their representatives in Government will be. In 1780 aside from public fora and rallies, newspapers came into being and became a platform to propagate news and views. Then, radio and television followed aside from the billboards and other print propaganda materials. Then in the 1990’s, the powerful social media came into existence. Of course, social media had its good uses -providing a new platform where people could exchange ideas and opinions and even sell goods and services for free. Just how big is “social media”? In the Philippines, about 67 million or 7 out of 10 of the 104 million Filipinos use “social media” with 36 million of them engaged on Facebook. Ten million of them are active on Instagram. Today 9 out 10 Filipinos have mobile phones and the platform used is (26% Facebook), (23%) Facebook Messenger, Twitter (13%) and Instagram ( 12%). One must either be living inside the caves or is sleeping like Rip Van Winkle for 100 years if he does not deal with “social media” today. But it is precisely because of its pervasiveness and accessibility ( being free ) that it has become a powerful source of information- true or fake. So this gave birth to trolls- paid hacks -who do nothing but propagate their points or view or attack those who oppose theirs. Twittersphere is populated by bots- robot accounts who are tweeting and retweeting the same messages. This kind of mass propaganda is practiced by both government and private interest groups to advance their causes- legal or illegal. Thus we have a proliferation of fake news to varnish images and assassination articles to attack personalities. People who engage in this, unfortunately, never help us to arrive at the truth. Or in elections -cannot help voters separate the facts from propaganda. It is our “democracy” that gets hurt- although their exercise of the “freedom to lie” is also within the ambit of their exercise of their “democratic rights”. But we have always postulated for years that one’s right to swing one’s elbow ends where the nose of one’s neighbor begins. The truth is that the victim because this exercise are people themselves because this results in “polarization”. Polarization really means one is exposed only to his like-minded people and exchange notes only with those who have their same beliefs. Enlightenment? Social media has become Everyman’s information highway- containing anything under the sun with little chance to place these under the scrutiny of intelligent judgment and comparison. As the Dictator Adolf Hitler had so advocated :” a lie said a thousand times- soon becomes truth”. This is what unbridled use of social media can bring. While there are libel laws in Mainstream Media and even in the cyberworld- there are few cases we heard of people actually being haled to court for defaming someone in “social media”. It has become a Frankenstein on the loose- man made and uncivilized. Anyone- with or little education can participate and while Mainstream Media prefers communication and journalistic experts, in social media- anything goes and anyone ie welcome. If these trolls, fake news dispensers and character assassins are paid hacks- everyone is also entitled to earn his keeps. But , it should be the duty of those who get hold of these passed on messages – to discern whether they are fake news and propaganda. Then delete them and not to pass them on to the next fool who knows no better. Mainstream media ,of course, is having challenges catching up with the proliferation of so much garbage in social media. Our only hope is that in due time, those independent -minded recipients will be able to separate the chaff from the grain, and take time to hear all sides, ferret the truth and make an informed decision who to vote for ( especially during this election time). We in Mainstream Media have tried our best to be a source of unbiased, pure information and even enlightened opinion. With this set-up, one is hopefully assured that people will know the latest happenings in the province as if he is just residing hereabouts. Now that we are faced with the challenge of providing news to the Boholanos worldwide, we always make it a point that we can give people scoop-worthy news and late breakers reported as they happen when they happen. Because of this- it would not be a surprise that a New Yorker will call his family back home on a news breaking event flashed through our website or FB account as events unfolding elsewhere in the province are transmitted quickly by our news teams. But even good things can also have their disadvantages. For instance, a news scoop can actually metamorphose into a “running story.” This means, we have to keep on updating the developments of a news story from time to time as new developments come into play. It can even happen that an update of a certain breaking news will eventually reveal some opposing facts to the first news release done few hours earlier. Yet, we have no choice but to upload breaking events immediately for us to keep up with the trend of delivering the news fast and fresh because social media is in competition. In the distant past -without the reckless social media in competition, Mainstream Media took time to await for all verifiable facts before we write the news, Now, followup stories of breaking news are commonplace. In this election season. we would also like to appeal to the public never to mix up their perception of the message and the courier of the message. We, in the Fourth Estate are mere couriers of the message. Thus if the message does not suit one’s belief and conviction, then it is totally unfair for the courier to bear the brunt of the criticism or blame entirely. They should turn their guns upon the source of the hostile message and then answer him or rebutt what he says in the same media platform or elsewhere. We in the Fourth Estate have no interest to side with any of the politicians as we are just here to convey the messages coming from third party sources. Don’t shoot the messengers, as they say. And to all die-hard supporters of any political camp, be aware that we are always prepared to depict both sides of the coin. Our decades in public service in print and radio had taught us invaluable lessons that politicians come and go – but Mainstream Media stays, It is intelligent for us to remain neutral. But we are not living in a vacuum. Many complaints have already been aired especially due to the Russian massive interference in the USA polls in 2016. Germany, for one, has already required social media platforms (like Facebook) to remove hate speech, fake news and illegal content within 24 hour of their appearance. In recent weeks , Facebook had removed scores of Philippine sources notoriously known to break their platform policies. And hopefully the watch will become more vigilant. We enjoin independent civic organizations, non-government organizations, truth watchdogs and the churches to lead in this counter reportage to report those sites which are notoriously peddling untruth and hate in the social media platform (I.e Facebook) since they that do not elevate the discourse especially related to the coming political exercise. We, as a people, deserve to have an environment free of poison. And It is not just due to climate change that we vehemently allude to here.